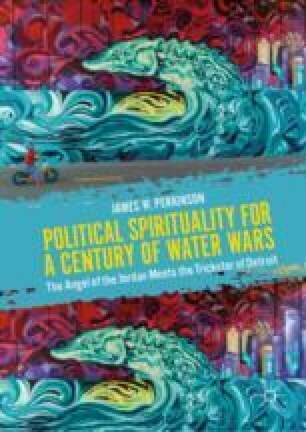 This book seeks to offer resources for re-imagining the biblical vision of water for a time quickly emerging as “the century of water wars” (successor to the twentieth century’s “oil wars”). It takes its animus and urgency from the author’s thirty-year immersion in Detroit struggles and more immediate four-year activist engagement pushing back on Car City water shutoffs in advocacy of a water affordability plan correlating income with usage. Provoked by that immediate struggle and beholden to an interreligious methodology of “crossing over and coming back,” the text will creatively re-read the biblical tradition under tutelage to the mythologies and practices of various indigenous cultures. In pursuing such an aim of re-visioning the potency of local water flows, the writing to follow will itself mimic the concern—“arguing” the question more in the mode of a wandering river than an efficient pipeline. It will first outline the colonial roots and future significance of the present water struggle in Detroit as supplying the gradient of passion for its motion. A second “meander” will engage regional Algonquian and Wendet sensibility coupled with Voudou and Yoruban traditions and ancient Celtic and Gallic mythology in order to more creatively “read” water politics “into” and “out of” the movement struggles led by John the Baptist and Jesus the Prophet in first-century Palestine. A final section will wind (snake-like) back up to the City of the Strait to call to the surface indigenous ways of engaging the place of the river and what they might mean for a global future of water battles. Zauzmer, Julie. 2016. Do It for the Water: Native Americans Carry Potomac Water on Prayerful 400-Mile Journey. Acts of Faith: Washington Post, October. Viewed September 11, 2017, https://www.washingtonpost.com/news/acts-of-faith/wp/2016/10/16/do-it-for-the-water-native-american-women-carry-potomac-water-on-prayerful-400-mile-journey/?utm_term=.f7d7716598b7.